This is a gorgeous dish, one of my favorites from Thailand. I mentioned it as my “meal of the week” on KLCC’s Food for Thought last Sunday. It’s an interpretation of a hot and sour shrimp recipe by San Francisco Bay Area Thai food maven Kasma Loha-Unchit, and a great way to use up extra cucumbers and hot peppers in the garden. Kasma was the Julia Child of Thai food for a certain group of Bayareans who came of age in the gay ’90s and noughts; she still cooks and hosts Thailand trips for students from her home in Oakland. For those of us who had fled the stodgy food of the Midwest in the late-1980s and found our culinary footing before the days of molecular gastronomy and fusion street food, Thai food was literally the taste of freedom. It was like Chinese food (which we knew, or thought we knew) but with vibrant, living flavors. Fresh vegetables! Coconut milk! Seafood! Not fried! And hot! O so hot! Kaffir lime leaf! Lemongrass! Over fragrant rice that took longer than a Minute! Everything about it was technicolor, in stereo, 3-D, digital, 3G. And Kasma, who offered classes in actually cooking what we were sampling at restaurants, offered the same thrill, I’d imagine, that Julia’s French cooking did for young American sophisticates in the 1960s. As for me, I was most assuredly a not-quite-sophisticate, as I relied on my lessons from my ex-boyfriend, who would come back from class and practice his dishes on me as I served as his sous-chef. Because that’s the beauty of cooking, right? We learn by sharing new techniques and ingredients, and by testing variations until we’ve hit on the perfect combination (that fleeting perfection). This joy is spread from one friend to the next through potlucks, dinner parties, and celebrations. And with each recipe we receive, each time we cook a dish prepared by someone who wowed us on a perfect evening and share it with others who exhale “wow,” the hues of our lives deepen and take on a richer sheen. And if you can find someone whose wow is your wow, then that, my friend, is one of the finest pleasures in the world. But back to the fish. I bought a pound of black cod at Newman’s, too much, but it was so pretty and I was seduced. The dish is usually for shrimp and is called, I believe, Pad Priow Wahn, or Hot and Sour Shrimp (with vegetables). The spicy vinegar a surprisingly natural combination for cucumbers, which we Americans never eat cooked. 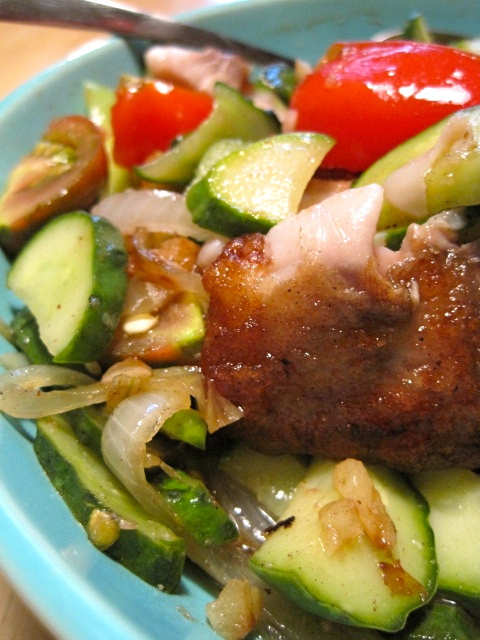 This stirfry just softens the cukes a bit, makes them more receptive for the sauce and seafood. I thought the fresh peppers, cucumbers, and tomatoes would be just as good over a mild pan-fried fish as they are with shrimp, and I was right. I served the other half of the fish in an equally gorgeous dish, also with tomatoes, but this one radically different. It used the same sauce as my Thai salmon “burger” recipe, which is also based on Kasma’s cuisine. Fragrant with sweet-spicy roasted chili paste, and strewn with Thai basil from the garden. 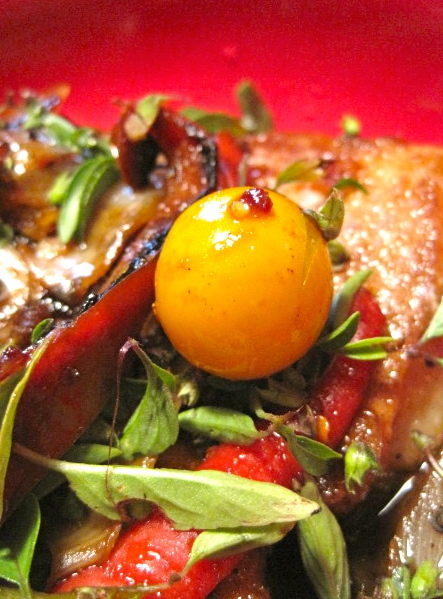 The dish is balanced by slightly bittersweet little ‘Sungold’ cherry tomatoes and yet more sunkissed peppers. Both dishes together are the essence of summer: one hot and sultry, one fresh and breezy. Work fast and hot. This is not the dish to simmer. No, work fast and hot. Run like the last days of summer. Serves 4 with another dish. 2 plum tomatoes or slightly underripe small slicers, cut in bite-sized chunks. Set up your ingredients in separate, small dishes — mince the garlic; slice the onion, peppers, and cucumbers; chunk the tomatoes. Mix together fish sauce, vinegar, and sugar in a small bowl. Marinate fish fillet in a bit of this sauce and some white pepper. Put rice flour on salad-sized plate or in shallow bowl for dredging fish. When pan is hot, add oil and wait a minute to pre-heat, then add fish fillet or shrimp. Cook fish until about 2/3 done (it will be brown on bottom and white most of the way up), then flip over in pan (for shrimp, just stirfry them until they are thoroughly pink). Add onion and garlic, which should start to brown immediately. Slow it down by adding the hot peppers. Remove fish and set aside in a serving dish. Add cucumbers and fish sauce mixture, then stirfry for a minute or so. Add tomatoes and sprinkle with white pepper to taste. Carefully arrange vegetables and sauce around fillet, or break apart fillet into four pieces and integrate into vegetables prior to serving. Garnish with cilantro, if you have it. senfgurken: vengeance will be mine! Senfgurken, mustardy pickled cucumbers popular in Germany, are warriors in the battle of the summer squash. Vengeance will be mine! We all know the war — summer squash vs. you. One day, you’re harvesting tiny cucumbers and zucchini, some even with their blossoms still on the fruit. You look carefully every day or so, removing the young, tender squash from their vines. But lurking under the trap doors, hidden down in the tangle of vines just out of reach, is a terrible creature biding its time until it can swell up and take over the garden: a monster zucchini or a yellowing, bloated, misshapen cucumber. Overgrown zucchini can be used for quick bread, of course, but I’ve always felt slightly ashamed of the bloated cucumbers. After all, what could I do with them? Discarded, they are sending the wrong message to the rest of the plants, that one can escape the gardener’s scythe if one just hides long enough. And then, if composted juuuuuuuust right (i.e., not correctly) your seeds will germinate and you will live again, muwahahahahahahh! 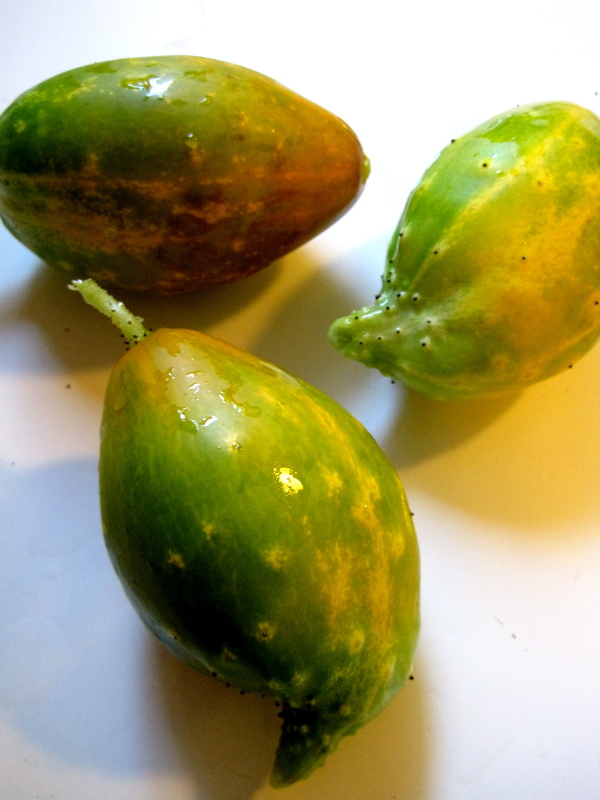 This vegetable revolt went unchecked in my garden until I discovered senfgurken, which magically transforms the yellowing cukes into mustard-spicy sweet pickles similar to watermelon rind pickles. Indeed, they are less work than watermelon rind pickles, too, and you don’t have to collect a bunch of sticky, hard-to-peel rinds. Use very yellow, very bloated, horrible-tasting, late summer cucumbers for this recipe. My cornichons didn’t yellow beyond this point, but the pickling cucumbers did. Any yellow-bellied cur of a slicing cucumber will be a marvelous martyr on the battlefield. Oh, and the seeds? Save them for planting next year, so the war can continue. And then you won’t have to fund it with money for schools or public programs! Peel cucumbers, halve, and scoop out the seeds (save for next year’s planting). Cut into strips about an inch wide, and cut the largest pieces in half. Salt slices, and soak overnight on the counter (or for 8-12 hours) until the cucumbers are pliable. Drain the cucumber slices, but do not rinse. Bring your water bath canner up to a boil and prepare your jars, lids and rings. Since you will be boiling them for 10 minutes, you do not need to sterilize the jars, but do wash well. 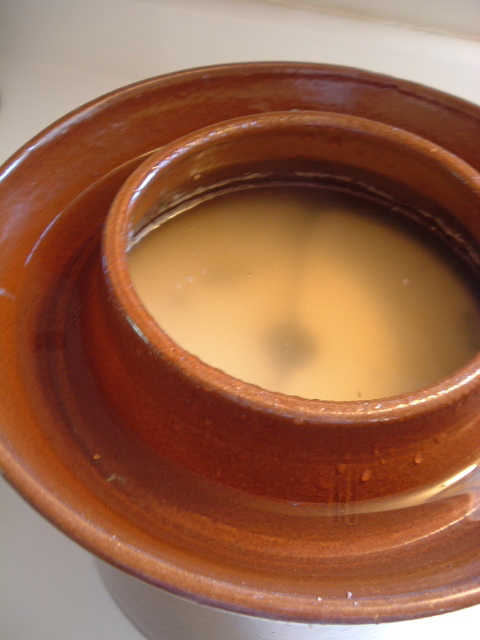 Combine the vinegar, sugar, and half of the mustard and pickling spices in a medium-sized pot, and bring to a boil. Reduce the heat, then add about half of the cucumbers to the brine. Let simmer for one minute. Then remove the slices with a slotted spoon and place in the jars with the aid of a wide-mouthed canning funnel. Once all the cucumbers are in the jars, fill to 1/2 inch from the top with the hot brine, including as many of the spices as you can. Remove air bubbles in each jar with a plastic knife or chopstick, packing the slices down well, and rearrange any slices floating with their tails pointed upward and well out of the brine. Wipe jar mouths and adjust lids and rings. Add the remaining spices to the leftover brine, then bring to a boil again and repeat procedure with the rest of the cucumbers. Once cool, check the seal on the jars and refrigerate any that did not seal. Remove the rings and keep jars in a cool, dark place for 3 weeks before eating your pickles. Serve with ham or other cured meats, pork roast, sausage, or cheddar cheese. This post contains two recipes: (1) a tested recipe for vinegar pickles, which are canned immediately and therefore called “Quick Kosher Dills;” and (2) a tested recipe that takes more time for fermented full-sour dills that you can either store in a cool place in a crock or can. See my fermented half-sour dill pickle notes if you’d like to develop your own recipe for that kind of pickle. There is a certain art in making fermented dill pickles, since the environmental conditions matter so much. We don’t have central air conditioning, so my house is subject to the vagaries of time and place. But it’s pickle time, and the pickle eating masses demand a good recipe! Most people aren’t as grumpy as I am about too-vinegary pickles, and the MFP in me feels slightly obligated to distribute a plain pickle recipe that people can use, especially after my own mom had to rely on an old recipe with no directions. So please find herewith two reliable, safe recipes from the Pacific Northwest Extension brochure called “Pickling Vegetables,” annotated and modified with my notes in green. If you’re interested in long-term storage, please follow these instructions carefully, as cucumber pickles are large enough to cause problems with the brine not penetrating and creating a haven for microorganisms. You will soon see why people don’t post these recipes — what a fussy pain! :) But I think we need an annotated, vetted pickle recipe on the interwebs, since there really doesn’t seem to be one. I don’t want to be the pickle nazi — we all have the responsibility to take our own risks with food and other activities, but part of that choice is to know what has been tested and recommended by food science folks. The first recipe allows you to put up dill pickles in pint or quart jars instead of a crock. You won’t have to refrigerate these if you process or low-temperature pasteurize them. What I like about this recipe is that it doesn’t use pickling lime or any hard-to-find spices, like mace. The second recipe is a more standard old-fashioned fermented pickle recipe. It is more fussy but will make better pickles, in my opinion. You have the option of either storing them in the refrigerator or boiling the brine and processing them for longer storage. When selecting cucumbers for pickling, don’t use the waxy supermarket variety, of course, and select the freshest, firmest, youngest, smallest cucumbers you can. Scrub with a very soft brush, since dirt tends to cling to them, especially in the crevices, and trim off any blemishes. If you can, pick them in the morning and put them up the same day. Try to have them all the same size, so they process evenly. Also of crucial importance is the length of the cucumbers. If you use pint jars, they will barely fit, and you’ll have to slice more off the end. You want the cucumbers to be no longer than one inch from the top of the pint jar (just under the lowest ring stamped in the jar), since you will fill it with brine to one-half inch from the top of the pint jar. You’ll be able to fit in 5-6 cucumbers per pint jar. For quart jars, you will have more leeway, but make sure the pickles don’t float to the top. Procedure: Wash cucumbers. Cut a 1/16-inch slice off blossom end [note: i.e., not the stem end. It’s usually the smaller, lighter-color end of the cucumber], but leave 1/4 inch of stem on the other end. Cut in half lengthwise [note: this isn’t necessary and they’re prettier if whole]. Heat salt, vinegar and water to boiling. [Wash and heat jars — I usually run the dishwasher immediately before canning, and leave the jars in the heated dishwasher. If you are particularly careful, you can boil the jars for 5 minutes before using. The lids and rings shouldn’t be boiled, but should be washed and brought up to 180 degrees in simmering water, then allowed to sit for 5 minutes before use. Use only new lids to ensure a good seal.] Pack cucumbers [as tightly as possible] into pint or quart jars, adding [one grape leaf per jar at bottom of jar,] 4 garlic halves, 2 heads dill [note: if large heads, use only one], and 4 peppercorns. Add 1/4 teaspoon hot red pepper flakes per pint, if desired. Pour hot vinegar solution over cucumbers to within 1/2 inch of top. [Gently tap or roll jar on counter to release air bubbles inside brine.] Adjust lids and use conventional boiling-water canner processing [note: this might soften pickles, but you can boil for 10 minutes for pints, 15 for quarts, following standard waterbath canning procedures] or [what I recommend] lower temperature pasteurization. Use the following quantities for each gallon of your container’s capacity. Procedure: Wash cucumbers. Cut a 1/16-inch slice off blossom end [note: i.e., not the stem end. It’s usually the smaller, lighter-color end of the cucumber], but leave 1/4 inch of stem on the other end. [Poke cucumbers with a knitting needle or thin chopstick to aid pickling.] Place half of dill and half of other flavorings on bottom of a clean, suitable container [i.e. 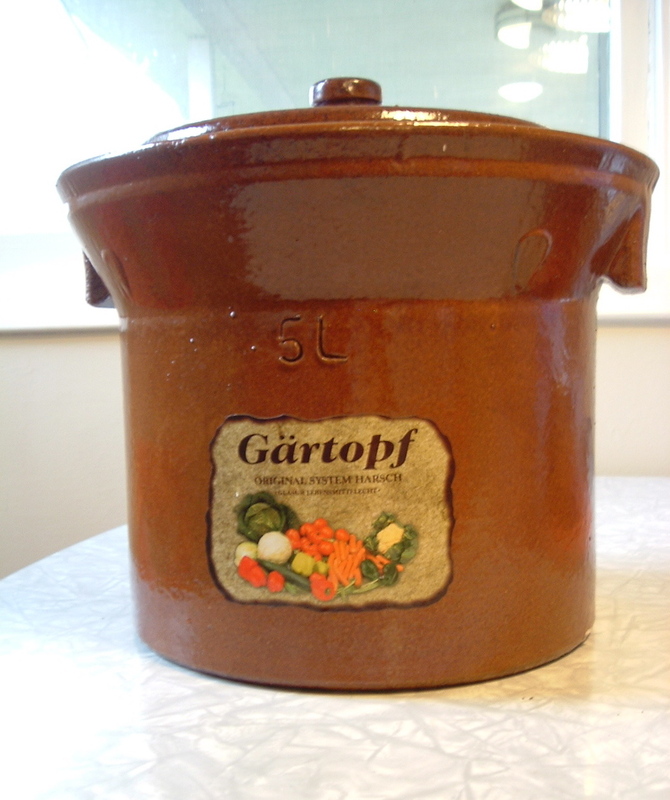 a crock or food grade plastic or glass containers, preferably 3 quarts or larger. DON’T use small jars for this recipe, as they won’t allow proper fermentation]. Add [grape leaves,] cucumbers, remaining dill, and flavorings. Dissolve salt in vinegar and water and pour over cucumbers. Add suitable weight [if you don’t have a crock with a weight in it, I recommend a gallon-sized Ziploc bag filled with brine (1 1/2 tablespoons of salt per 1 quart water) that you close up and place snugly in the container after filling it. Double-bag for security, but if it leaks, the brine is the same concentration as the brine in the container.] and cover [with a clean towel. Do not seal the container or the fermenting may make the lid blow off. If you are using a crock, follow the manufacturer’s instructions about the lid]. Store where temperature is 70 to 75 degrees F for about 3 to 4 weeks. Temperatures of 55 to 65 are acceptable [and in my opinion, make much better pickles], but the fermentation will take 5 to 6 weeks. 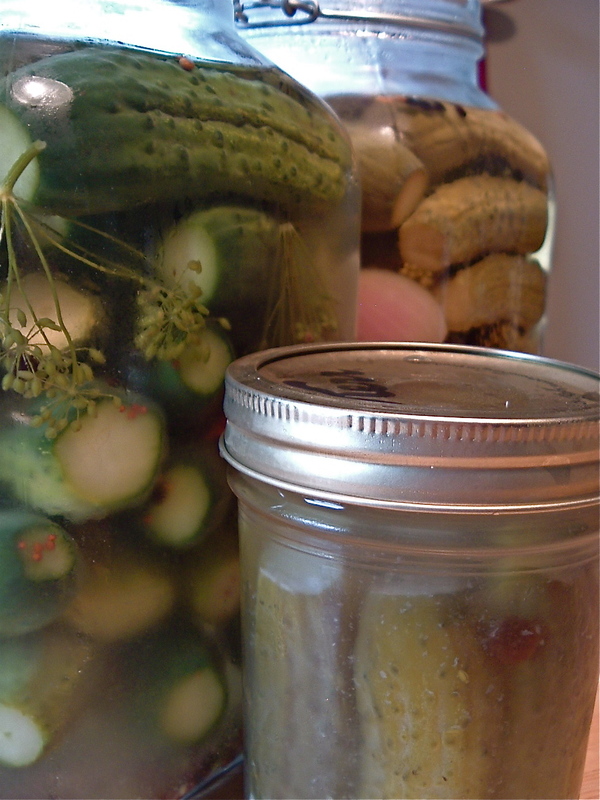 Pickles will become too soft if temperatures are above 80 degrees during fermentation. 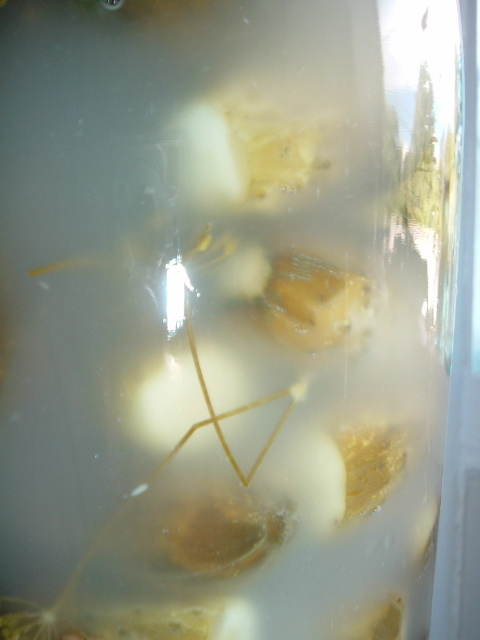 Fully fermented pickles may be stored in the original container for 4 to 6 months, provided you refrigerate them and remove surface scum and molds regularly. 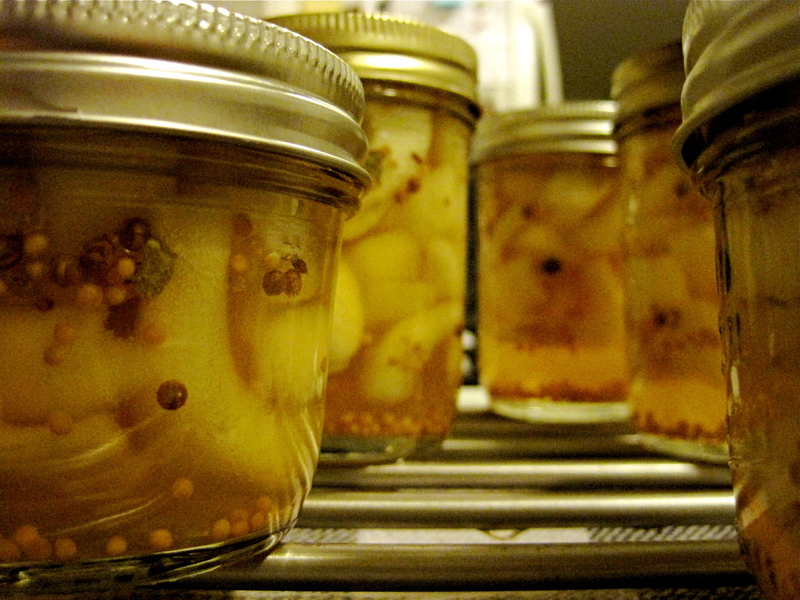 Canning is a better way to store fully fermented pickles. To can them, pour the brine into a pan, heat slowly to a boil, and simmer 5 minutes. Filter brine through paper coffee filters to reduce cloudiness, if desired. 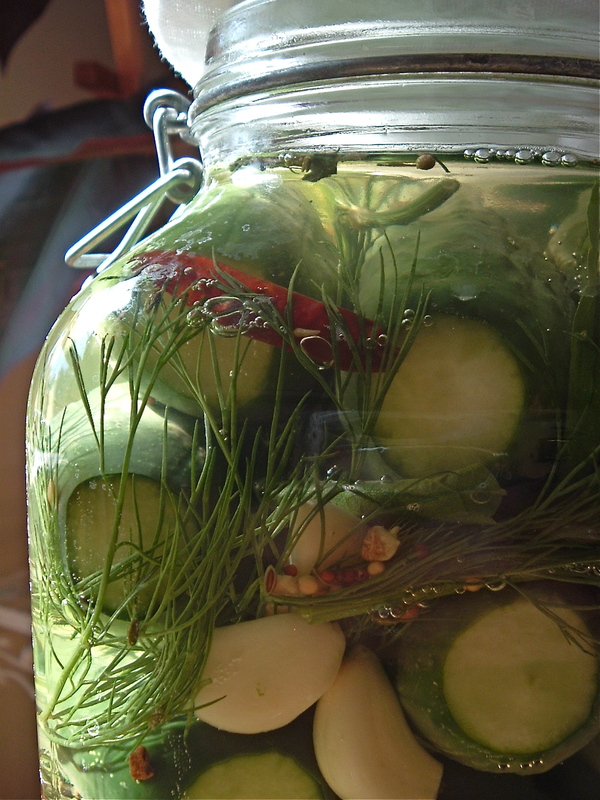 Fill pint or quart jars with pickles and hot brine, leaving 1/2-inch headspace. [Gently tap or roll jar on counter to release air bubbles inside brine.] Adjust lids and use conventional boiling-water canner processing [note: this might soften pickles, but you can boil for 10 minutes for pints, 15 for quarts, following standard waterbath canning procedures] or [what I recommend] lower temperature pasteurization.